We’ve given you a rundown of the Air Max line this week, showing you the most recent AM 2009 and AM 95 releases. 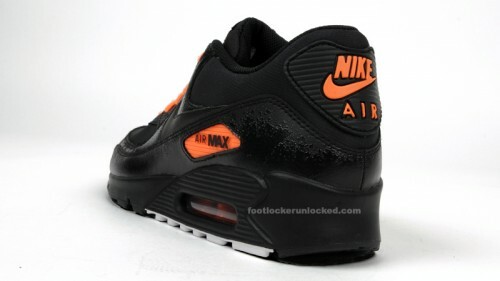 We couldn’t leave off without showing respect to the Air Max 90, so check out this black/total orange release, set to hit Foot Locker sometime between mid-August and mid-September. These would be tight for Halloween, although you know how I feel about total orange all year long. Definitely feeling the subtle splatter-shine on the leather upper as well. There is also a grey section of the outsole, a slice of which is visible on the profile. More shots after the jump and in the gallery.